"You mean you're deliberately choosing to go on the run from your own people, in a rackety old TARDIS?" "Why not? After all, that's how it all started." The 20th Anniversary was here! The new season of the series began in January and was again shown twice weekly rather than in its usual Saturday slot. 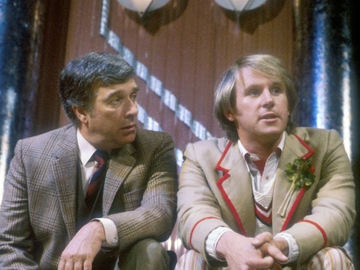 Being the 20th season, John Nathan Turner had decided that each story of the season should include some element of the Doctor's past. The first story, 'Arc of Infinity' saw the return of 10th Anniversary villain Omega who was once again trying to break back into our Universe. He succeeds too, creating a new body for himself that resembles the Doctor. However his body breaks down after being chased through Amsterdam and he's sent back where he came from. Another return from the more recent past is Tegan who turns up in Amsterdam, having lost her job. There she meets up again with the Doctor and Nyssa and rejoins the TARDIS crew. One other appearance of note is a guest performance by one Colin Baker, playing a Gallifreyan guard captain who ends up shooting the Doctor. Colin, who later in 1983, was officially announced as Peter Davison's replacement has often remarked in interviews that is the only actor who played the Doctor that appeared previously in the series in a different role. He was also the only Doctor actor who ever got the chance to shoot his predecessor! Tegan returns just in time for the next story 'Snakedance', which sees not only the return of the Mara (last seen in 'Kinda') but an early TV appearance for Martin Clunes, whose rather sinister performance is somewhat undermined by his very 80s, not-so-sinister appearance. Following 'Snakedance' comes a trilogy of stories that have been retrospectively referred to as 'The Black Guardian Trilogy'. Perhaps not surprisingly, this trilogy features the return of the Black Guardian who, if you recall, had been trying to hunt the Doctor down since the end of the Key to Time Season in 1979. As the Guardians don't get physically involved with events, the Black Guardian enlists the aid of someone to kill the Doctor. That someone is the enigmatic and not entirely trustworthy Turlough, a young alien who has been sent to Earth for reason as yet unclear. 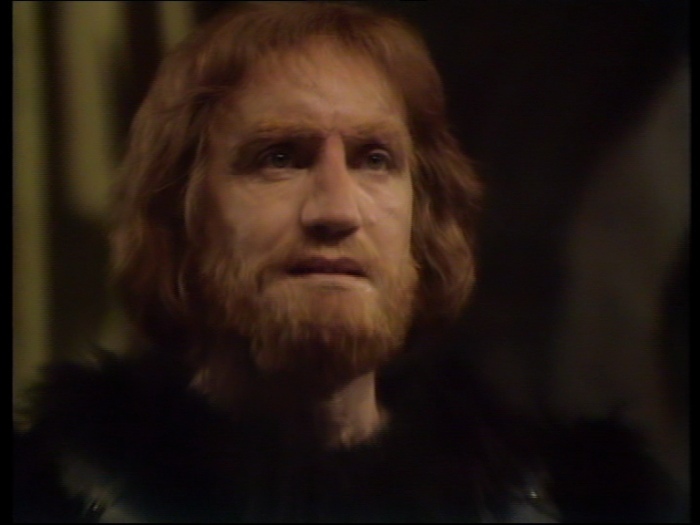 Turlough agrees to help the Guardian kill the Doctor in return for being able to return home. As we discover in the first story of this trilogy, 'Mawdryn Undead', Turlough is also a student at a private boy's school where one of the teachers in none other than Brigadier Lethbridge Stewart, now retired from UNIT. 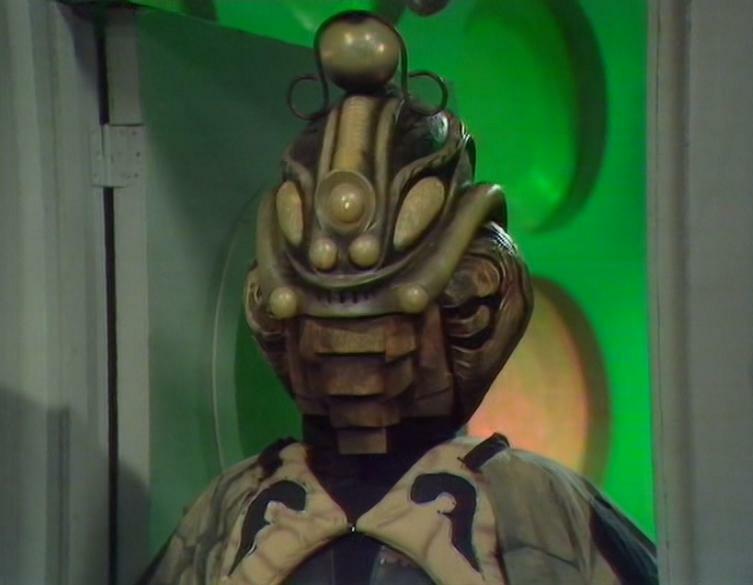 However the Brigadier is suffering from amnesia and can remember nothing of the time he spent with the Doctor fighting monsters. Fortunately the Doctor, with the aid of a clip montage, is able to jog the Brigadier's memory. 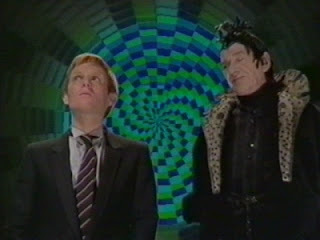 Turlough aids the Doctor and the Brigadier in dealing with a spaceship full of 'undead' aliens who want to take the Doctor's regeneration energies and use it so that they themselves can finally die. In the process, the Brigadier meets himself from 6 years in the past (it's all a bit complicated to explain), a meeting which results in the 'younger' Brigadier suffering the amnesia that his older counterpart was suffering from when the Doctor encountered him. Like I said, it's complicated. 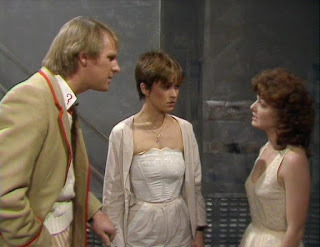 Having impressed the Doctor, Turlough joins the TARDIS crew (much to disappointment of Nyssa and Tegan who don't trust him), still with the intention of killing the Doctor. Unluckily for him, he doesn't much of a chance to follow through in the next story, 'Terminus'. On the Black Guardian's orders, he tries to destroy the TARDIS only to cause it to land on a spaceship full of sick people suffering from a deadly disease. He and Tegan then spend much of the story trapped beneath the floors of the ship, doing very little. Nyssa, on the other hand, contracts the disease that is killing everyone else on the ship and, once she has found a cure, chooses to stay behind to help those that are still suffering. The final part of the 'Black Guardian' trilogy, 'Enlightenment', takes the Doctor, Tegan and Turlough to what appears to be an Edwardian sailing ship. The truth is revealed is what is one of my favourite episode cliffhangers. The 'ships' are all crewed by Eternals who are immortal beings who seems to have nothing better to do than to come with entertaining diversions like racing each other across space. One of their number is, like Turlough, an agent of the Black Guardian and it's at this point that Turlough realises the error of his ways. 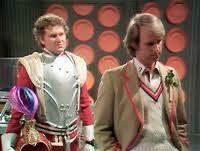 He turns on the Black Guardian and finally sides with the Doctor. With the Guardian finally defeated, the TARDIS travels to 13th Century England and the court of King John in the final story of the season, 'The King's Demons'. Here, the blast from the past in none other than the Master, once again in one of his pointless disguises. Here's he trying to prevent the signing of the Magna Carta, for no particular reason. To do this he is using a robot called Kamelion, which is capable of changing shape, to impersonate King John and generally cause trouble. What's interesting about Kamelion is that, rather than being played by a man in a robot suit, Kamelion is in fact a genuine remote controlled robot - a more sophisticated version of K9. 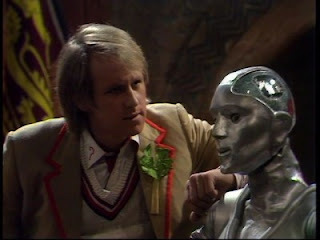 For some reason John Nathan Turner thought it would be a good idea to make Kamelion a companion. So, in this story, the Doctor breaks the Master's hold over Kamelion and takes him off in the TARDIS along with Tegan and Turlough. Unfortunately, Kamelion was very limited in what he could do. He couldn't for example walk at all. So although he officially joins the TARDIS crew here don't expect to see much of him in the future. That was it for Season 20 but not for the 20th Anniversary. In November of 1983 came the anniversary story against which all seem to be judged: 'The Five Doctors'. Or 'Three Doctors, one stand-in and a no-show'. 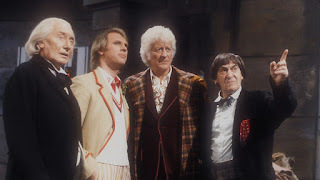 The intention was to bring all five Doctors together for one big showdown on Gallifrey but with William Hartnell no longer with us, the First Doctor had to be re-cast. Richard Hurndall puts on a great performance but he's no William Hartnell. Furthermore, Tom Baker had chosen not to appear although he did appear briefly in scenes that were originally filmed for the aborted story, 'Shada'. Those Doctors who did appear were all teamed up with various companions from the past (Susan, the Brigadier, Sarah Jane and of course Tegan and Turlough) and made face off against the various monsters and traps in Gallifrey's Death Zone before travelling to the tomb of Time Lord founder Rassilon where misguided President Borusa is trying to claim immortality for himself. Packed full of Doctors, companions, monsters and other nods to the past, 'The Five Doctors' doesn't really stand up to much scrutiny as a story but is a still a lot of nostalgic fun. Anniversary stories don't come much more fun than this. 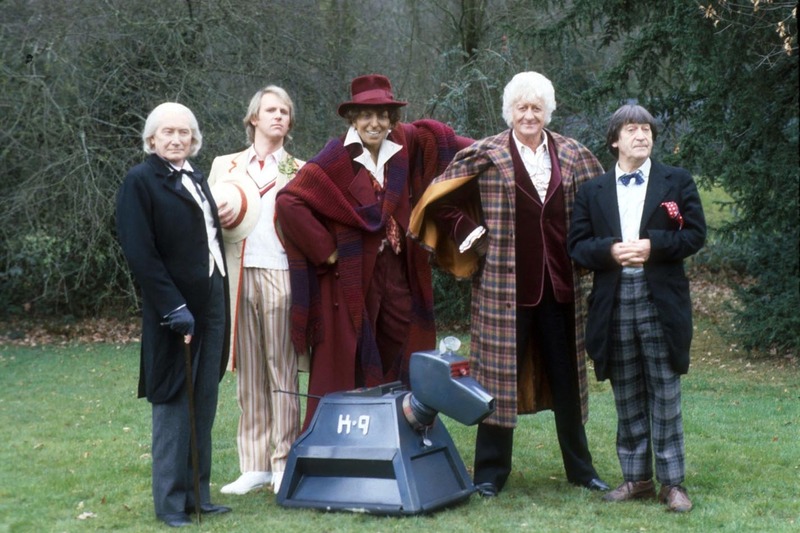 On the video front, 1983 saw the first video release of a Doctor Who TV story. 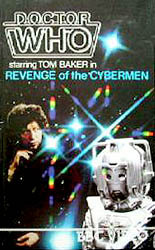 They story chosen for the debut release was the 1975 Tom Baker story: 'Revenge of the Cybermen'. Notably the cover of this video included a photograph of the wrong type of Cyberman. Rather than depicting a Cyberman that actually appeared in the story, the cover instead shows the more modern Cyberman as seen in 'Earthshock'. Later editions of the video would have a new cover featuring the correct type of Cyberman. As well as being the first official video release, 'Revenge of the Cybermen' also had the honour of being the first Doctor Who LaserDisc release. For those too young to remember, a LaserDisc was like a larger version of a DVD. LaserDisc players first appeared commercially in the late 1970s but never really took off in a big way. That said, LaserDiscs were still available up to around 2000 and 'Revenge..' was the first of several Doctor Who releases throughout the 80s and 90s. 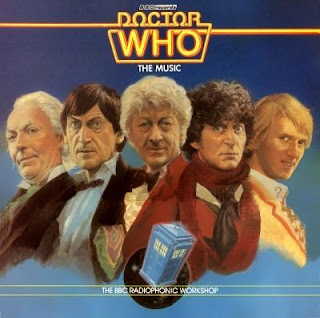 The main release of note was 'Doctor Who: The Music'. This album featured incidental music from throughout the series's 20 year history. That said, most of the music actually comes from the late Tom Baker and Peter Davison eras (in other words: the 1980s) and virtually nothing from the 1960s and 1970s at all. The novelisations were dominated by Fifth Doctor releases in 1983. Indeed, the only non-Fifth Doctor book was 'Meglos', written by Terrance Dicks. The other releases this year were: 'Time-Flight' (by Peter Grimwade), 'Castrovalva' (written by Christopher H Bidmead), 'Earthshock' (written by Ian Marter), 'Terminius' (by original TV writer Stephen Gallagher writing under the pseudonym John Lydecker), and 'Four to Doomsday', 'Arc of Infinity' and 'The Five Doctors' all novelised by Terrance Dicks. 'The Five Doctors' is somewhat special in that it is the first novelisation of a TV story to be released before said story is actually shown on TV. The book was released two weeks early meaning that fans who couldn't wait to see it on TV could pick it up in their local WH Smiths and read the whole thing. It's perhaps just as well there was no Internet in those days or we's have had spoilers all over the place. 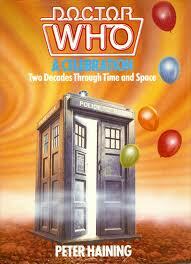 The big anniversary book was the appropriately titled 'A Celebration', written by Peter Haining. This large hardcover book was indeed a celebration of the entire series, detailing the history of the programme up to the end of Season 20, and including contributions from many of those involved with the making of the series. So well did this book sell, that Peter Haining would end up writing another three such books over the next few years. Two of the more intriguing books of the year were 'The Doctor Who Who Technical Manual' and 'The Unfolding Text'. The former was essentially a collection of blueprints and illustrations of many of the devices and robots that appeared in the series, including the TARDIS, K9 and the recently departed sonic screwdriver. We also got see what the inside of a Dalek really looks like. 'The Unfolding Text', is a very different book. Written by two university lecturers, Professor John Tulloch and Manuel Alverado, this was the first serious academic study of the programme. Probably not a book for the average fan at the time. In other book news, Target realeased a number of new Quiz books, there was the latest Annual and Peter Davison lent his face and name to another book of non-Doctor Who related short stories, this time one about Alien Planets. Just as it had done in 1973, the Radio Times released a 20th Anniversary Special magazine. This provided an overview of the series, the Doctors, the companions and the monsters. 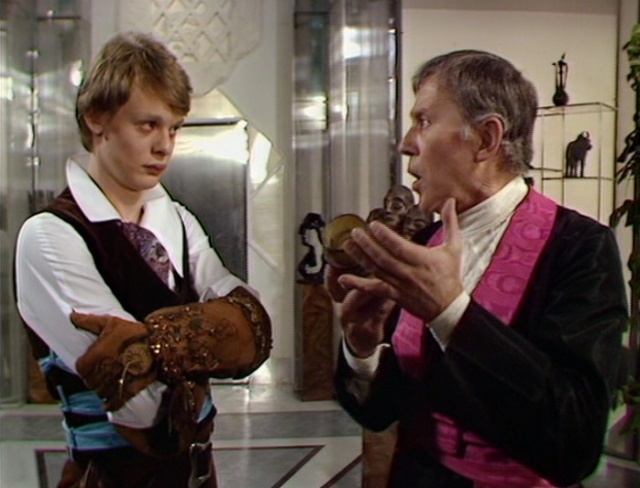 It also included a short story, 'Birth of a Renegade', written by script editor Eric Saward. It featured the Fifth Doctor, Tegan and Turlough going up against the Cybermen and the Master and being reunited with Susan. It also purports to give an explanation for the Doctor's decision to leave Gallifrey and provides a back story for Susan - albeit one that has been contradicted since then. For Doctor Who Monthly, it was pretty much business as usual in 1983. The magazine managed to obtain interviews with, amongst others, Patrick Troughton and the elusive Jackie Lane, who had played companion Dodo in the Sixties. In issue 83 (dated December 1983, published November) they ran an interview with Heather Hartnell, the widow of the late William. The magazine also played a somewhat cruel April Fool's joke on it readers. The magazine ran an article in its May issue (published in April, of course) stating that John Nathan Turner had discovered footage from a partially filmed but never completed William Hartnell Doctor Who story. JNT apparently was going to use this old footage and combine it with new specially filmed scenes featuring Peter Davision to create a brand new story featuring the First and Fifth Doctors. Filming, it was said, was due to commence on 1 April...Needless to say, it was all a load of rubbish although people still wrote into DWM years later asking about what had happened with this story. The comic strip saw the return of Time Lord agent Shayde in the second half of 'The Stockbridge Horror' as he assists the Doctor in defeating the Elemental creature. The Doctor is then taken prisoner by his fellow Time Lords and is put on trial as it transpires that the very existance of the Elemental creature is his own fault. Having successfully defended himself, the Doctor takes his leave of Stockbridge and travels to a remote island in the Pacific Ocean for some fishing in the next story, 'Lunar Lagoon.' There he finds himself captured by a Japanese soldier and caught up in a raid by the US Airforce. The story introduces a new companion for the Doctor, American fighter pilot Gus who was shot down over the island. With no other way to leave he island he agrees to travel with the Doctor. What's interesting about this story is that, despite the fact that it appears the Doctor has landed in the midst of World War Two, it transpires that he's arrived in 1963 in an alternate timeline where the War didn't end in 1945. This is further expanded upon the next story, '4-Dimensional Vistas'. This story sees the Doctor and Gus encounter the Meddling Monk (last seen on TV way back in 1967 if you recall) who is helping the Ice Warriors to build a huge sonic weapon. It's the Monk that has caused the time anomalies. The Doctor puts a stop to both the Monk and the Ice Warriors by shunting them into another dimension. I haven't really mentioned Doctor Who conventions in this overview, mostly because there have been so many over the years that it would be near impossible to list them all. The 20th Anniversary Convention in Longleat, though, is worth a mention not least because it was one of the biggest Doctor Who events to take place in the UK. I was too young to attend the event myself but from what I've read of those who did attend, the Longleat event was to Doctor Who what Woodstock was to music. But presumably with less drug taking. The event was expected to draw 50,000 people over the two days but 37,000 turned up on the first day alone. Many people had to be turned away and the roads around Longleat were apparently brought to a standstill. Those who did get there got to experience, props and costume display, including whole sets from the recently filmed 'Five Doctors', screenings of classic stories, loads of merchandise to be bought and, of course the talks and signing sessions from a wide variety of guests. All four surviving Doctors were there - even Tom Baker - and many of the companions and other guest actors were present as well. Though there have been many, many Doctor Who conventions over the years, none has been bigger than the Longleat event.